A big thanks to Holly & Martin for providing the bar cart for this post and a SECOND one to give away to one lucky reader! Follow the instructions at the bottom of the post to enter. I love when a piece of furniture or home decor can perform double duty, especially in a smaller home. 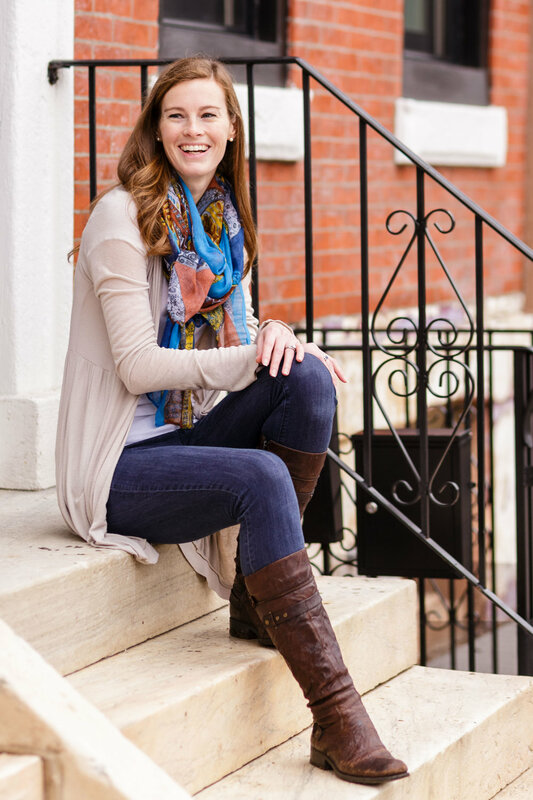 Our row house in Philadelphia definitely falls into the "petite" category (it checks in right at a cozy 1200 square feet) so I'm always keeping an eye out for versatile pieces that will serve us well. 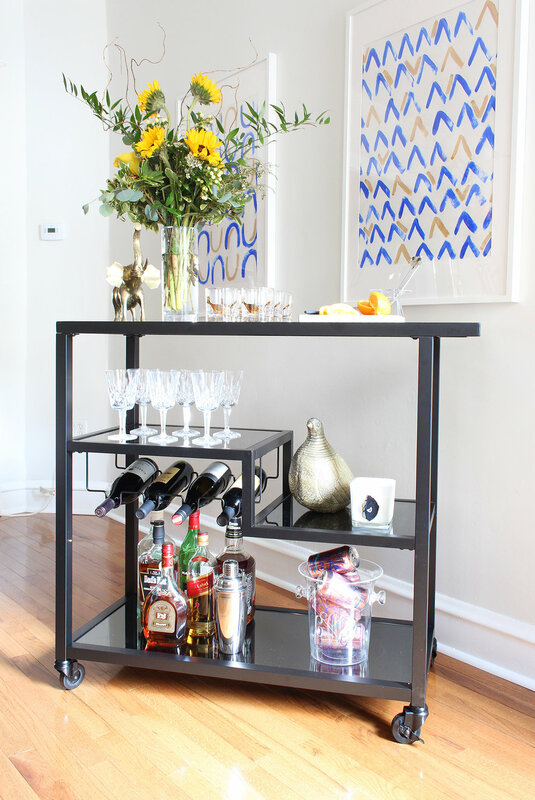 When Holly & Martin invited me to choose a piece of furniture from their collection, their Zephs Bar Cart in black immediately caught my eye because bar carts can be used in so many ways! Plus, after admiring them in so many others' homes and on Pinterest over the years, I'll admit that I couldn't turn down the opportunity to get my hands on one of my own. To show you how versatile a bar cart* truly is, I decided to style it up in two completely different ways: in a traditional bar setup and as a spot to store and display wardrobe accessories. It was so fun to think creatively about how to pull off these two looks. I'd love for you to weigh in with which one you like best! Plus, find out how you can win one for your own home at the end of the post! Now let's head to setup number two! 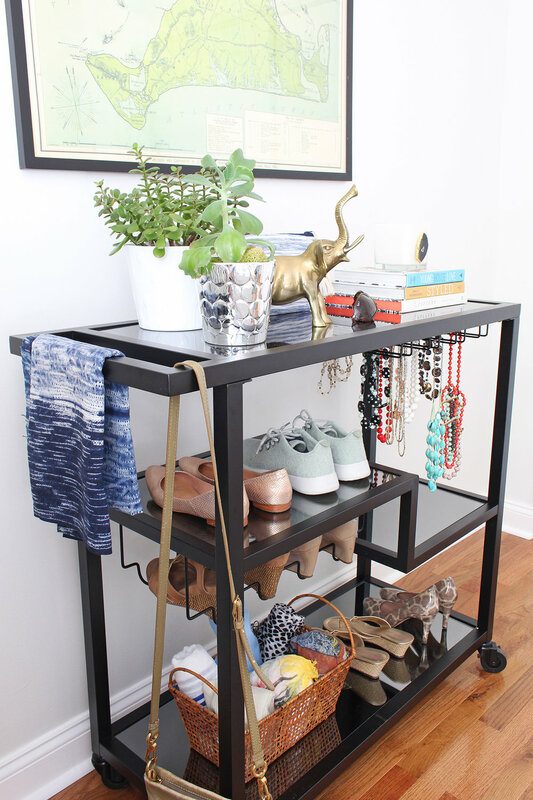 Using furniture and decor in new or unusual ways is always a fun experiment, and using a bar cart to hold wardrobe accessories is certainly different. 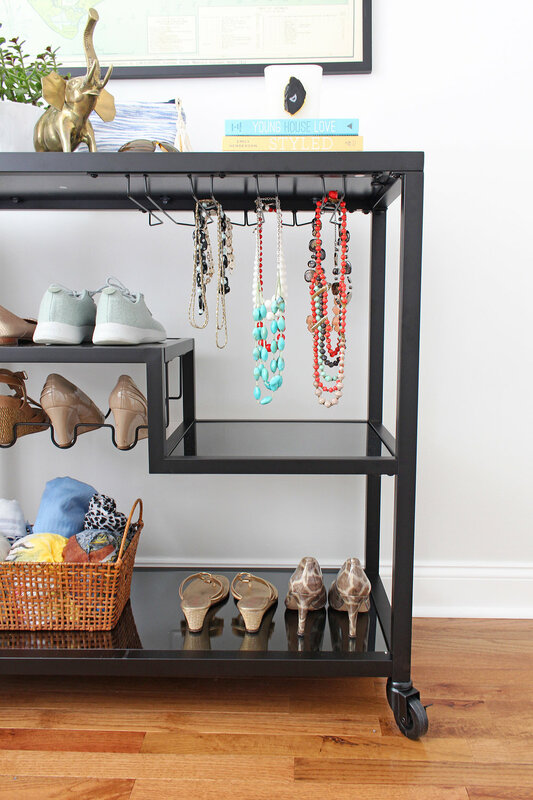 As it turns out, wine bottle racks are perfect for holding heels, and the glass racks work well for displaying jewelry like necklaces! If you had a mirror hanging above it, you could easily use this piece as a vanity too. Store your makeup on top and you've got the makings of an all-in-one place to get ready in the morning! So tell me - what's your favorite out of these two ideas? Would you use a bar cart with a traditional bar setup, or get creative with storing your accessories? Now before I get to the giveaway, I wanted to share a few general comments about Holly & Martin's functional, stylish, and affordable pieces - those three adjectives add up to a winning combination in my book! I can speak to the fact that they stand the test of time as well, since we've had one of their coffee tables in our living room for three years now. After three moves, it has held up beautifully and we always get compliments on it. If you follow me on Instagram, you've seen it a number of times. 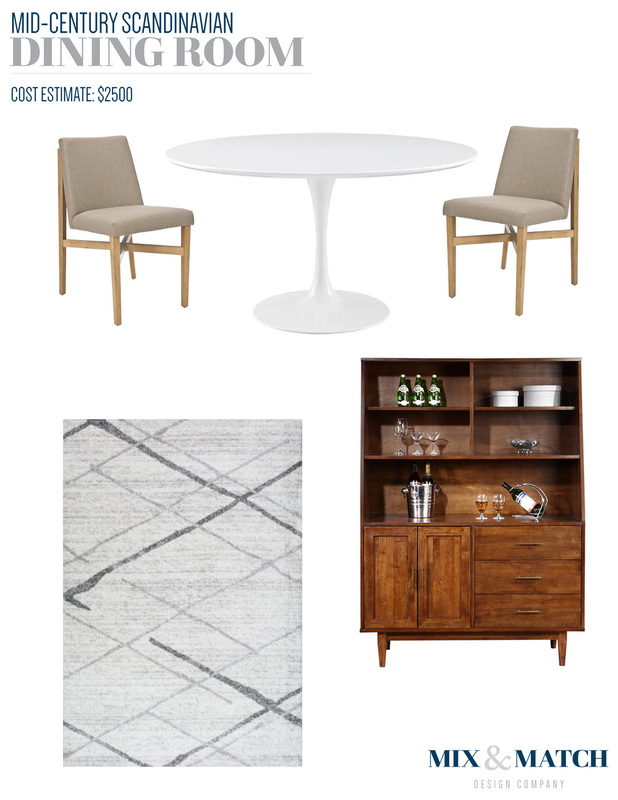 :) Their pieces are easy to assemble and thoughtfully designed - definitely take some time to look through their collection! 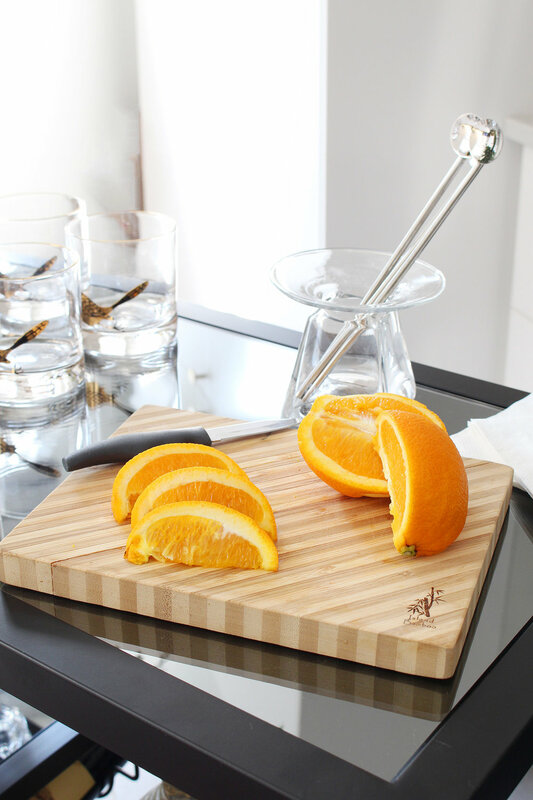 Finally, I love that you can find Holly & Martin pieces in a lot of places you already shop online including Wayfair, Overstock, The Mine, and Hayneedle. Each place carries a different selection, so be sure to hunt around if you're on the lookout for a specific piece. All right, now let's get to that giveaway I promised! Holly & Martin has generously offered a second black Zephs Bar Cart that I have the pleasure of giving away to one of you! 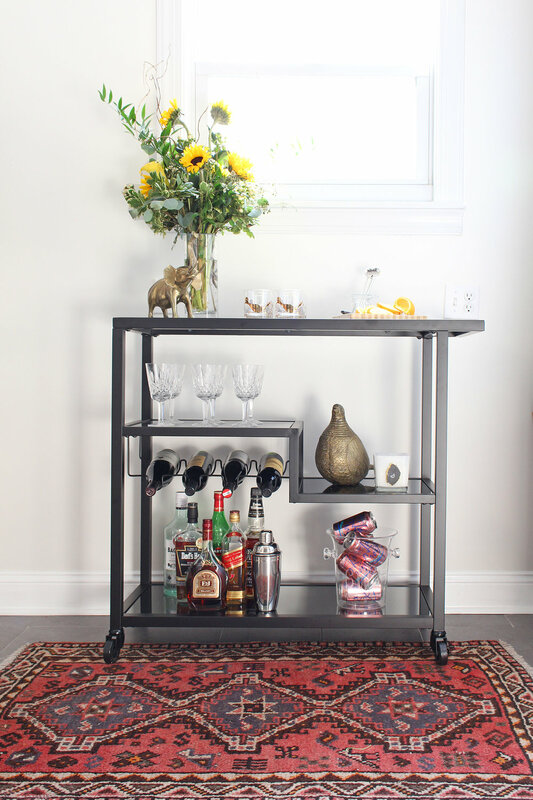 All you have to do is leave a comment on this blog post telling me how you would use a bar cart in your own home along with your email address. You can also enter the giveaway on Instagram - keep an eye out for a post that will go live at 9pm EST on 9/4/17! Terms and conditions: This giveaway is open to U.S. residents ages 18 and older, and closes on 9/12/17 at 11:59pm EST. A winner will be chosen at random and has 10 days to claim his or her prize. If, after 10 days, the winner has not claimed the prize, another winner will be chosen at random. This giveaway is being run concurrently on Instagram, but is in no way sponsored, associated, endorsed or administered by Instagram. This post was written in collaboration with JORD Wood Watches. They provided a beautiful watch for review in this post, but as always, all opinions are my own! With a change in seasons comes an opportunity to change up some of the decor in our homes. I think we've all recovered from the onslaught of holiday decorating (right? ), and now I'd say we're solidly in what I like to call the dead of winter. If you live in a place that has a cold climate this time of year like I do in Philadelphia, I'll bet you have the urge to layer up and bring on the cozy vibes. (Wood burning fireplace, anyone?) Bringing that feel into our homes can help stave off the some of the doldrums that these cold, long months can bring. I'm a big believer that inspiration for decorating can come from anywhere. Lately, I've been pulling some from fashion, so when JORD recently contacted me about reviewing one of their stunning wood watches, I thought it was a perfect excuse to talk about show it off and talk about fashion-inspired winter decorating! They sent over the Frankie watch in Koa and Ash for my husband to try (I pretty much only wear my FitBit, so I thought he'd enjoy it more - isn't that nice of me? Ha!) and I absolutely love its simplicity, the warm tones of the wood, and how lightweight it is. Most link-style watches are so heavy since they're made of metal, but that's definitely not the case here. My husband's style is classic and timeless (he's a great dresser, if I do say so myself :) ), and this watch fits right in with that look. It has staying power, and it's definitely something he can wear for years to come. But, being cozy doesn't always have to mean something that's actually fuzzy and soft - think about the warmth that other textures and finishes can bring to a room. Wood tones, warm metals like brass, different textures, and deeper colors like the navy of my husband's blazer in the photos above can all contribute to that feeling. I could totally design a room around the photo above - perhaps a man's home office? - it would be classic and timeless, but with a modern twist. The JORD watch packaging provided the perfect jumping-off point for mixing textures and colors together for these photos. It came in a sturdy wooden box (you can see it in the opening photo), and inside, the watch was wrapped around a little burlap pillow. It all fits right in with the mix of plaid, silver and brass accessories I wanted to include. Take a look at what folks are wearing this time of year as you go about your daily life (as we've learned today, even a unique watch can be a source of inspiration!) and note when certain patterns, textures, and colors catch your eye. Mimic what you see by bringing in different pieces things like pillows, blankets, accessories. 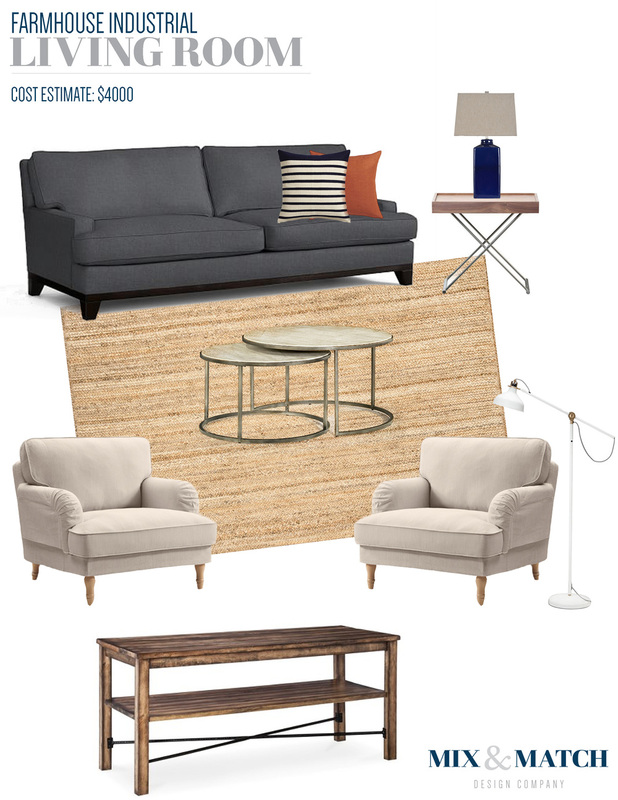 We're not talking about a full scale makeover here, just a few items here and there to create that layered, cozy vibe throughout your home! 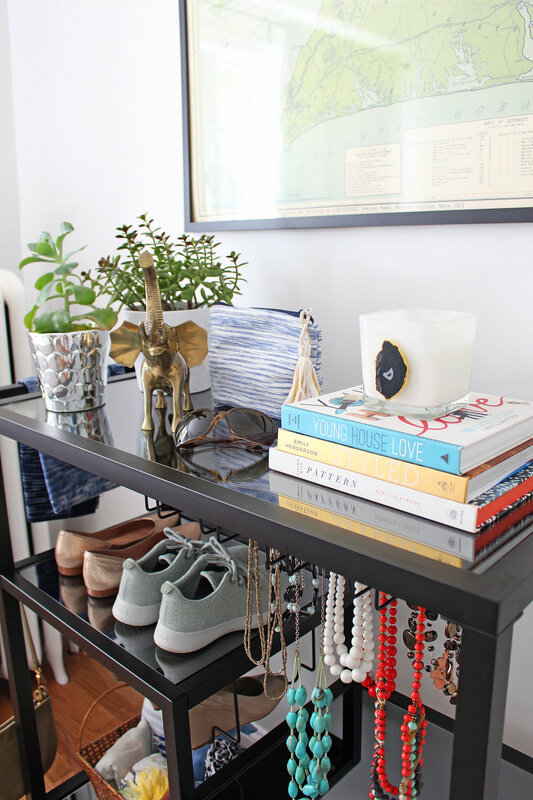 Think plaid blankets, woven baskets, and brass accessories you can stick on a bookshelf. Have fun! And now let's get to the good stuff - the GIVEAWAY! JORD has generously provided a $100 gift code that you can use toward anything on their site. Every person who enters using the button below will be eligible. (If you're on a feed reader or seeing this in your inbox, you may have to click over to the post on the website to enter) In the end, only one (1) person will win the code, but everyone will receive a consolation code worth $25 at the end of the contest! Fine print: the contest will close January 29th at 11:59pm. The $100 and $25 Gift Codes will expire April 30th, 2017. Do you live in the Philadelphia, PA or Washington, DC metro areas? Want to win some free design services? If you answered "yes" to those two questions, you're in luck! I'm excited to announce that Mix & Match Design Company is giving away a free full room design package to one lucky person. 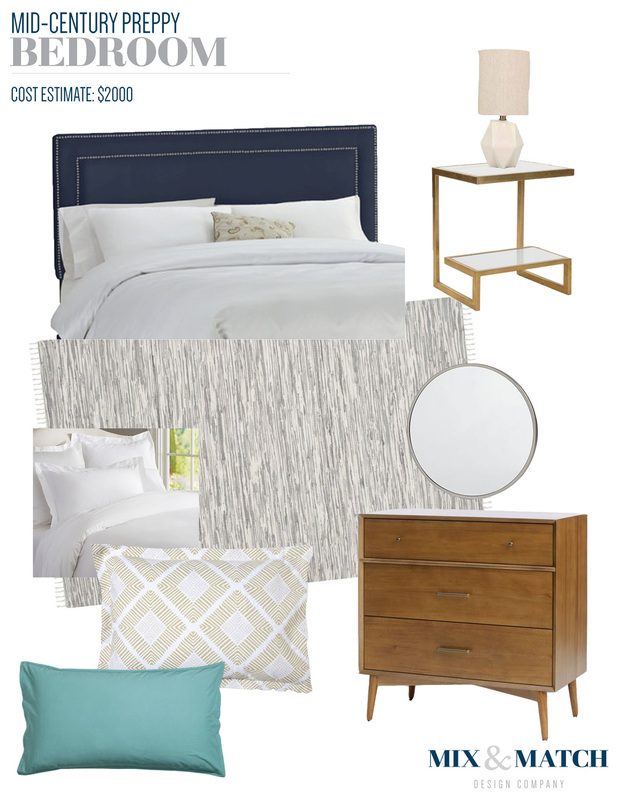 So if you've been dreaming of transforming a space in your house - be it a bedroom, living room, nursery, etc. - and need help making that happen, now may be your chance! Interested? Read on to make sure you qualify and how to enter your space. The survey will close on April 15th, 2016 and a winner will be selected after that date. I can't wait to work with one of you!! P.S. I would love it if you would help spread the word about the giveaway to your Philly and DC-area friends. The more the merrier!